After the Civil War, corporations grew to unprecedented size. The public was suspicious of this concentration of economic power, and politicians responded in 1890 by passing the first antitrust law, the Sherman Antitrust Act. Over the years, antitrust policy has evolved through further legislative acts and amendments, regulatory guidelines and judicial interpretation, which have implications for pricing strategies. Join Ed and Ron as they discuss some of these laws, as well as the economics of price signaling to competitors, which is not a violation of antitrust laws. After the Civil War, with the development of better transportation systems that integrated a host of local markets into a national market, business corporations grew to unprecedented size in order to take advantage of economies of scale. As this process unfolded, many small and undercapitalized businesses went bankrupt or were purchased by larger concerns, and the term robber baron gained currency. The public was suspicious of this concentration of economic power, and politicians responded in 1890 by passing the first antitrust law, the Sherman Antitrust Act. The act was thought the perfect remedy to stop any business from monopolizing its market and to restore efficient competition to the economy. Over the years, antitrust policy has evolved through further legislative acts and amendments, regulatory guidelines and judicial interpretation, which obviously have implications for various pricing decisions. Although services are not subject to certain provisions of these laws—for instance, price discrimination—many businesses are affected, and the laws need to be taken into account when formulating pricing strategy. Sherman Antitrust Act, 1890: Made acts in restraint of trade illegal. Standard Oil and American Tobacco Cases, 1911: Broke up both firms (each of which accounted for more than 90% of their industry) into smaller companies. The Federal Trade Commission Act (FTC Act), 1914: Established to investigate unfair practices and issue orders to “cease and desist.” In addition, it established the Federal Trade Commission. Clayton Act, 1914: Outlawed unfair trade practices. Restricted mergers that would substantially reduce competition. Robinson-Patman Act, 1936: Strengthened provisions of the Clayton Act, outlawing price discrimination. Every contract, combination in the form of trust or otherwise, or conspiracy, in restraint of trade or commerce among the several States, or with foreign nations, is hereby declared to be illegal . . .
Every person who shall monopolize, or attempt to monopolize, or combine or conspire with any other person or persons, to monopolize any part of the trade or commerce among the several States, or with foreign nations, shall be deemed guilty . . .
A 1974 amendment to the Sherman Act made violations felonies rather than a misdemeanor as in the original law. The Justice Department initiated a number of legal actions against large corporate holdings, none of which were as important as the one filed in a St. Louis Federal Court on November 15, 1906, against the Standard Oil Company of New Jersey. By 1880, John D. Rockefeller was the king of the industry, with his Standard Oil Company holding the dominant market share, which grew between 1870 and 1879 from 4 to 90 percent. How did he achieve such a dominant market position? Legend has it this was predatory pricing: the act of deliberately underselling competitors in certain markets in order to drive them out of business. Once they are gone, the monopolist raises the price in the absence of competition. History books have immortalized this view of Standard Oil, and predatory pricing has been a major concern of government antitrust lawyers, politicians, and the general public then and now. Unfortunately for lovers of legends, this one has been laid theoretically and empirically prostrate. In a now classic article, John S. McGee theorized that Standard Oil did not employ predatory practices because it would have been economically foolish to have done so. In the first place, McGee argued, such practices are very costly for the large firm; it always stands relatively more to lose since it, by definition, does the most business. Second, the uncertainty of the length of the forthcoming battle, and thus its indeterminate expense, must surely make firms wary of initiating a price war. Third, competitors can simply close down and wait for the price to return to profitable levels; or new owners might purchase bankrupt facilities and ready them to compete with the predator. Fourth, such wars inevitably spread to surrounding markets, endangering the predator’s profits in his “safe” areas. And last, predatory practices already assume a “war chest” of monopoly profits to see the firm through the costly battles; firms apparently cannot initiate predatory practices unless they already possess monopoly power. But if this is true, firms cannot gain initial monopoly positions through predatory practices. It is important to note that most antitrust cases are filed by one business against another (customers have no standing to sue). The treble damage provisions also provide an incentive for harmed competitors to call attention to the government of violations. Even though the government won its case against Standard Oil, and tobacco trusts, supporters of antitrust, were still not satisfied with the narrow interpretations by the court, Congress began work on two additional legislative initiatives designed to prevent further anticompetitive business practices. The Federal Trade Commission was established in order to enforce the provisions of the Sherman Antitrust Act in a more rapid manner than could be achieved by judicial law. The first sentence of the FTC Act reads, “Unfair methods of competition in commerce are hereby declared unlawful.” Section 5 of the FTC Act reads, “The Commission is hereby empowered and directed to prevent persons, partnerships, or corporations . . . from using unfair methods of competition in commerce.” The FTC could ban a business practice merely because of the suspicion that it promoted unfair competition, without the permission of a court. Also, the FTC has the authority to subject pricing practices to administrative review, not in order to punish past wrongdoing, but to make new law. The FTC is empowered to order a business to cease and desist from any practice it deems unfair, even if that practice would not necessarily be deemed unfair or anticompetitive in a court of law. The Clayton Act was passed to correct various defects and omissions of the Sherman Act. Specifically, it prohibits anticompetitive mergers, tying arrangements, exclusive dealing agreements, interlocking directorates, and the acquisition of stock in competitor companies. The antimerger provisions were further strengthened in 1950 when Congress passed the Caller-Kefauver Antimerger Act. Also, Section 2(a), as amended by the Robinson-Patman Act, prohibits predatory price discrimination, but only in tangible products (it does not cover real estate, services, technology licenses, lease of facilities, or contract rights and privileges). After the passage of the Clayton Act in 1914, chain stores grew rapidly and increased their buying power, and this type of price discrimination was thought to threaten the survival of independent wholesalers and retailers. Therefore, in 1936, Congress passed the Robinson-Patman Act in order to strengthen the Clayton Act. This was in the middle of the New Deal, and protecting small businesses was viewed as a legitimate goal of antitrust policy. During the Great Depression, government policymakers were averse to price competition, believing it to be a major cause of the economic stagnation of the 1930s. Small business interest groups, in fact, were the impetus behind the passage of the Act, which was actually drafted by the U.S. Wholesale Grocers’ Association. 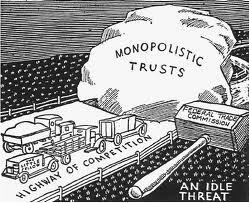 The foregoing acts are the major foundation of antitrust policy today. They have been amended many times by later legislative acts and special exemptions have been granted to various interest groups, such as labor unions, insurance companies, and farm cooperatives.
. . . The Robinson-Patman Act is opposed by virtually all economists. I hope the Subcommittee will reflect upon the fact that if all the prominent economists in favor of the Robinson-Patman Act were put in a Volkswagen, there would still be room for a portly chauffeur. People of the same trade seldom meet together, even for merriments and diversion, but the conversation ends in a conspiracy against the public, or in some contrivance to raise prices. Antitrust is an obsession of American lawyers, but I have no use for it. Any monopoly holds an umbrella over the newcomers, to be sure, but I am not afraid of monopolies because they eventually collapse. Thucydides wrote years ago that hegemony kills itself. A power that has hegemony always becomes arrogant. Always becomes overweening. . . . It becomes defensive, arrogant, and a defender of yesterday. It destroys itself. Indeed, studying the history of antitrust cases and policy, one is left with the conclusion that almost any type of pricing behavior by a company is in violation of the law. If a company raises its prices above its competitors, it must be a monopoly. If a company lowers its prices below that of its competitors, it is obviously engaging in predatory behavior. If a company maintains its prices for any period of time, it must be colluding with its competitors to fix prices. Firms and individuals take market prices as given—each is small relative to the market so that their decisions do not affect the market price. Individuals and firms have perfect information about the quality and availability of goods, and about the prices of all goods. Actions by an individual or firm do not directly affect other individuals or firms except through prices. Goods are things that only the buyer can enjoy—if I buy and eat a slice of pizza, it is no longer available for you to eat; if you buy a bike, we both cannot use it at the same time. There are several problems with this model. In a world of perfect competition there would be no need for advertising; yet Proctor & Gamble alone spends $5 billion on advertising its products, and we surely cannot make the argument that Proctor & Gamble is irrational. The perfectly competitive model that posits all sellers are price takers would be, in reality, a world of no competition, no innovation, no market power, and no dynamism. It is emphatically a market no developed country’s people would want to live in. Yet, it is the ideal model used by antitrust economists and lawyers to benchmark anticompetitive behavior, and it is contrary to how the real world works. Competition, by its very nature, is not a level playing field. All businesses are striving for monopoly profits, but even when attained they are not long sustained. No market reflects the assumptions of the competitive model, which is why the majority of economists agree that the extreme cases of monopoly (no competition) and perfect competition (where no firm has any effect on market prices) are rare. Most markets are characterized by imperfect competition. Because there is no demand for new and unknown goods, no demand for the unforeseeable fruits of innovation and genius, preoccupation with demand fosters stagnation. The notion of perfect competition—a prime image of classical theory—is extremely useful in depicting the behavior of particular markets for existing goods. But it has little to do with the central activity of capitalism, which is the turbulent process of launching new enterprise. As has been often observed in academic analyses, perfect competition actually comes to mean no competition at all: an equilibrium in which all participants have perfect information and in which companies can change neither prices nor products and can essentially affect neither supply nor demand. Perfect competition thus excludes most supply-side behavior: all the acquisition and manipulation of knowledge that is the main activity of real entrepreneurs. Free men and creative enterprise—all the secrets and surprises of actual competition—are banished in favor of a mechanism by which savings are automatically invested, supplies and demands are simultaneously reconciled, and the entrepreneurial role could be best performed by modern computers. Antitrust has a rich and fascinating history, rooted firmly in the development of economic theory as well as the emotional appeal among the public, politicians, and the media. The robber barons have an infamous reputation among American culture, even though many would argue it is a misapplied name for entrepreneurs who brought needed goods and services—at constantly lower prices—to the masses. In any event, executives in charge of pricing need to be cognizant of the law and its implications for devising pricing strategies and tactics. And although the laws do not apply to services, if your company is engaged in manufacturing, or deals with distributors and suppliers, then appropriate legal advice needs to be obtained to ensure you are complying with all applicable federal and state antitrust laws. What should pricers do when they are confronted with naïve competitors attempting to engage in a price war? Begin by attempting to ascertain—through gathering of competitive intelligence—why they are dropping prices; it may not be to start a price war but rather to simply clear out inventory or utilize excess capacity. Successful companies tend not to spoil the market, the ones offering inferior value propositions do, and thus have the most to gain from initiating price wars. If you find yourself in the unfortunate position of having to offer a price discount, do not announce it publicly, as this will provide a signal to your competition and they may intensify the war. The risk in lowering prices is to signal to customers that you have been overcharging them in the past, while giving legitimacy to your competitor’s offerings. Examine ways to offer more value at the same price—quicker deliveries or lead times—rather than match the price discount. Offer more favorable payment terms, or longer contracts. Rather than discounting planned price increases, delay them. If you are going to provide a discount to match a competitor, consider doing it only on incremental volume. Consider offering other value-added benefits—co-op advertising, loyalty programs, and so forth—that will maintain the integrity of your “list price” and shift the discounts off-invoice. Pricers need to consider the total cost of engaging in a price war, not just one battle. You may gain marginal market share by undercutting your competition, but the risk is that you will lower prices throughout the entire industry, which are very difficult to return to prewar levels. Customers, like elephants, have excellent memories, especially at remembering the lowest price they ever paid, which is why grandpa constantly regaled you with stories of how candy used to cost five cents in his day. Price wars can desensitize customers to value, making them focus more on price. If the competitor should return to more rational behavior with a price increase, immediately follow, so as to reward smart pricing. It is always better to let competitors maintain an advantage based on a higher price than a lower one, since this makes it more costly for them to cut prices in the future. Do not fall prey to what economists call coordination failure—a situation in which each firm is reluctant to be the first in its industry to announce a price change. This industry-wide hesitation produces price stickiness. Imitating competitors’ prices is known as conscious parallelism, which is lawful in the United States and the European Union as long as there is not explicit agreement among the companies. Of course, as with all antitrust laws, there is an enormous gray area between illegal collusion and lawful conscious parallelism, and it is always wise to engage legal counsel for guidance. Also weigh the benefits and costs of offering a price match guarantee to your customers, a way to engage in tacit price collusion among competitors. This strategy can result in less competition and higher prices, although this effect is not assured. Executives need to constantly speak and write about the importance of value and the perils of price wars in industry and trade publications. Be sure not to engage in speculative pricing declarations, since you can only announce what your company actually intends to do with prices in the future. In the final analysis, the best way to avoid price wars is to avoid the commodity trap by offering more value to your customers; but if you are caught in one, these strategies can help to ameliorate the effects and shorten the length of these self-destructive practices.